What is the South-East Marine Protection Forum? The South-East Marine Protection Forum was a non-statutory body established by the Minister of Conservation and the Minister for Primary Industries in April 2014. 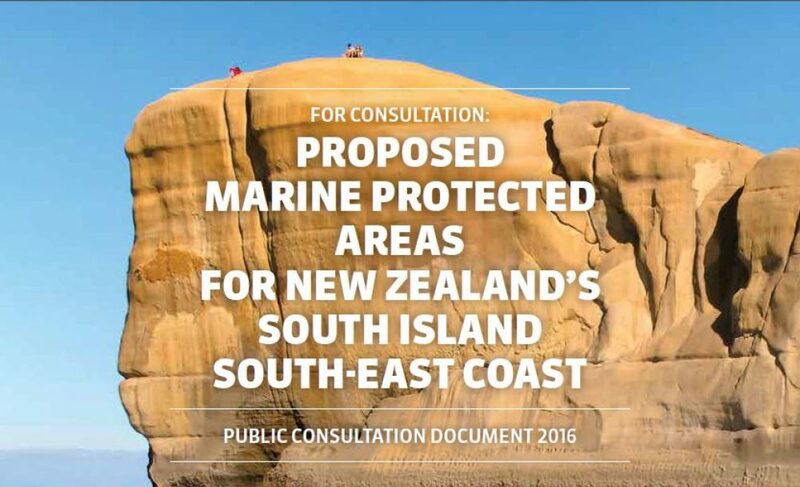 The Forum was tasked with providing recommendations for marine protection for the coastal area from Timaru in South Canterbury to Waipapa Point in Southland, and out to 12 nautical miles. Members of the Forum represented the interests of tangata whenua, commercial fishing, recreational users, conservation groups, tourism, marine science, local government and communities. The Forum delivered its final Recommendations Report to Ministers on 23 February 2018. The Forum was supported by the Department of Conservation (DOC) and the Ministry for Primary Industries (MPI). Why was the south-east coast targeted for this process? The south-east stands out as being the only large coastal region in the country without any marine protected areas. Its spectacular coastline is home to some of our most endangered species such as the yellow-eyed penguin, northern royal albatross and New Zealand sea lion. It boasts deep water bryozoan thickets, rare in the world, that provide protection from predators for juvenile species and it also features giant kelp forests that provide habitat for many fish species. New Zealand has made international commitments to protect marine biodiversity. Those commitments include conserving at least 10% of our coastal and marine area by 2020. What threats does our marine environment face? People who have lived by and worked in the sea for decades have told us of the changes they have observed in the health and abundance of marine life and the level of biodiversity in the Forum’s region. The scientific community have been generous with their time to explain to us what they know about what is causing these changes, and threats to the resilience of the ecosystems in the future. run-off from urban and agricultural land. How can a network of marine protected areas address those threats? A well-designed network of marine protected areas can contribute to the long-term survival of habitats and ecosystems in a healthy and functioning state in the face of such pressures. They help habitats and ecosystems to adapt and recover in response to disturbance, both natural (such as storms) and human induced. Any reduction or loss of biodiversity, for example, the extinction of a species, can detrimentally affect other species or even entire ecosystems. Marine protected areas can provide a foundation for research and education that will provide benefits for our understanding of marine ecology, the impact of pressures on the marine environment, conservation efforts and biodiversity in general. How does the South-East Marine Protection Forum area fit in with the rest of New Zealand’s MPAs? The first marine protected areas developed under the MPA Policy was for the West coast, South Island. The South-East Marine Protection Forum area is the second marine protected area process for mainland New Zealand.. The offshore sub-Antarctic islands have also been through an MPA Policy process. A Type 1 MPA is a marine reserve or ‘no take ’area. A Type 2 MPA has restrictions specific to what is being targeted for protection; ‘a fit-for-purpose’ set of restrictions. Type 2 MPAs still allow some fishing and harvesting, but restrict specific fishing methods and other activities (e.g. mining) in the interests of biodiversity protection, particularly those that cause sea bed disturbance. Why did it take the Forum so long to make its recommendations? The Forum received 2803 submissions, adding up to over 10,000 pages. The Forum went out to consultation with a commitment to consider all the information that the public presented in their submissions. To honour that commitment, the Forum required enough time to properly familiarise themselves with the range of views presented and to process new information that has been provided. The length of time taken for the Forum to make its recommendations compares favourably to other processes. (For example, the West Coast process which took seven years from the consultation phase until implementation). Why were two options presented? The Forum process saw a wide range of community views presented through submissions, and differences in views between various groups and sectors. The split in views resulted in two alternate networks being recommended. What are the differences between the two Networks being recommended? Although the proposed protection and boundaries of the two networks differ, they have several sites in common. Network 1 covers 14.2% (1267 km2) of the Forum region and includes six Marine Reserves (no-take/no-disturbance areas) and five Type 2 MPAs (where restrictions are placed on certain types of fishing). Network 1 also prohibits the commercial harvesting of bladder kelp north of the Otago Peninsula. It includes 18 of the 22 coastal habitats found within the Forum region. The Network 1 recommends some sites with more extensive boundaries than what was consulted on. These extensions, as well as the detailed protections for the recommended Type 2s, will all be subject to further consultation through whatever statutory process the government chooses, should it implement the recommendations. Network 2 covers 4.1% (366 km2) of the Forum region and includes three Marine Reserves and two Type 2 MPAs. Network 2 includes 10 of the 22 coastal habitats found within the Forum region. Will both of the networks be adopted, or one or the other? The Ministers will review all the recommendations and both network options will be considered. They may accept all, some of, or none of the recommendations. Any recommendations that are accepted will be required to go through the appropriate statutory processes. This will include opportunities for further consultation and public input before they can be implemented. The ultimate goal is to implement a single network of marine protected areas for the south-east coast of the South Island. What recommendations were made in terms of how these MPAs would be managed? The Forum recommends that any management structure for an MPA within the network provides for the ability for co‑management by Kāi Tahu and the Crown, as Treaty partners. Co-management would enhance the retention and transfer of mātauraka between the generations, and maintain the connection to rohe moana. In conjunction with co-management the Forum also recommend a 25-year generational review for all MPAs in the network. What role did science play in the process? The science sector was formally represented on the Forum, as well as other forum members having some science background or training. To ensure that the forum was informed about the relevant science, DOC and MPI provided scientific support, relevant published literature was made available, and two science workshops were run where leading marine scientists volunteered their time to share their knowledge. The Forum took scientific information and viewpoints into account, along with other considerations required under the Policy. What public consultation did the Forum undertake? The Forum initially consulted widely with manawhenua, local communities and interest groups about marine protection, and at the same time considered available scientific information. In October 2016 the Forum released its public consultation document which contained 20 sites for possible inclusion in a network of Marine Protected Areas, and called for submissions. It also held public information sessions throughout the region. Submissions closed on December 20, 2016. 2803 submissions were received. These can be downloaded from Your submissions. A summary of submissions is also available. Since then the Forum has been working through the varying views and determining which sites and what level of marine protection would be recommended to Ministers. How did the Forum deliberation process work? There were two steps involved in the deliberation process. The first was a site by site analysis and the second was an MPA network design process. The Forum worked their way through each site that was consulted on using a deliberation record which contained all the existing information the Forum has about the site. New information provided by submissions was added to this record. This was done in two stages. Stage 1 assessed the site for its habitat types, viability as an MPA, kaitiakitanga currently practiced and available management tools / protection measures. Stage 2 assessed impacts on users – positive and adverse. subject to changes or negotiation, and / or evaluation of network design matters. extent to which the full range of habitat or ecosystem types is protected in a marine reserve; identify gaps in terms of protection of habitat types, including protection of rare, distinctive or internationally or nationally important habitat types. replication of different habitat types. If a choice had to be made between similar sites what deciding factors were considered? Where there was a choice to be made between several sites that would add a similar ecosystem or habitat to the network, the site(s) chosen were those that minimised adverse effects on Treaty Settlement obligations and existing users as per the MPA Policy. benefits such as educational, diving and tourism opportunities. Why did the Forum’s deliberations take place ‘in committee’, thereby excluding them from being a matter of public record? There were 16 members of the Forum including iwi and representatives of various stakeholder groups. For discussions to be frank and robust, they had to have confidence that they could express points of view without fear of any public repercussions, while considering their recommendations. Where possible the Forum also undertook to release a public-record of each meeting which can be found on this website. What was DOC and MPI’s role in the process? DOC’s role has been to facilitate and support the Forum to achieve high quality recommendations for the Ministers. This involved managing the Forum meetings and the overall project deliverables. The Ministry for Primary Industries also supported the Forum with support staff and technical expertise. The Ministers will review all the recommendations. Any recommendations made in the report that are accepted by the Government will be required to go through the appropriate statutory processes and there will be opportunities for further consultation and public input. How long will it take before there are any Marine Protected Areas in place? There is currently no timeframe as to when MPAs might be implemented. How do Ministers make their decision? A marine reserve is established by Order in Council made by the Governor General. A final decision on whether to recommend an area as a marine reserve is made by the Minister of Conservation, who needs agreement of the Minister of Transport and the Minister for Primary Industries. The Minister for Primary Industries decides whether to recommend to the Governor-General to make the fishing regulations for Type 2 MPAs. For measures relating to impacts of fishing on the aquatic environment, the Minister for Primary Industries makes the final decision. What further role will DOC and MPI play now? Agencies including DOC and MPI will provide Ministers with advice on the report. Once Ministers have provided direction DOC and MPI will run the statutory processes required to implement marine protection. If an MPA was implemented, DOC’s role would be to undertake ongoing monitoring and compliance of the protected area.